If you are a regular reader of my blog then you'll know by now that New Look is my favourite place to shop. They cater for all my tall girl needs without costing me a fortune, I can always find something when I go in-store and my online wishlist just keeps growing. New Look don't just do Women's clothes though, they are currently re-launching their menswear and I'm pretty excited about it. It's obvious that I'm not a man but that doesn't mean I can't love the range, one day I will finally get my brother to let me style him! Until then though New Look have launched Man Crush Monday's, I think we've all got a little (or big!) crush on a certain male celebrity and today I'm going to be styling mine with some of my favourite picks from the New Look menswear line. Personally I've got a bit of a thing for David Tennant, don't ask me to watch the episode where he leaves Doctor Who because I'll just cry and cry! Before we even get to the clothes though I have to say I'm not loving the facial hair that he's sporting at the moment so if I were to restyle him that would have to go. I've seen some very questionable outfits that he's worn but at the same time he tends to go a bit too simple sometimes, it can be difficult to find the right balance though. I know that navy suits him well from all of the suits he wore in Doctor Who so I've gone for some Slim Fit Faded Wash Navy Jeans that are always in fashion and they go with a lot of things. 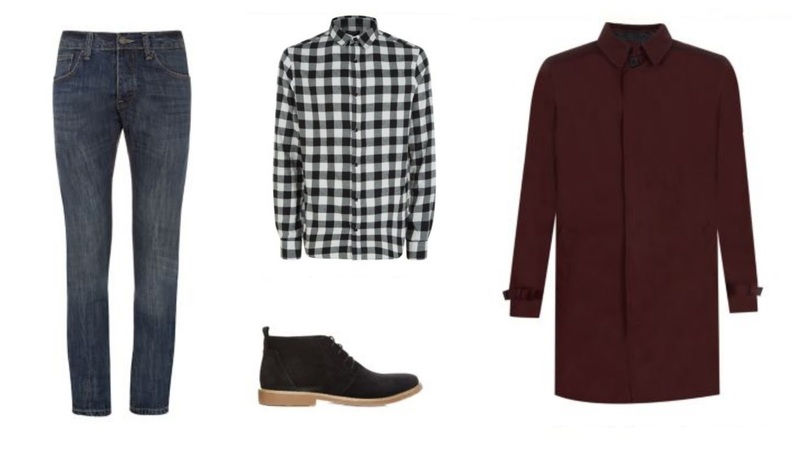 In Autumn you really cannot go wrong with a checked shirt either, this Grey Check Long Sleeved Shirt is simple but it is definitely a step up from just a plain white or black shirt. I've carried on with the theme of taking a little step up from boring when it comes to shoes, I love these Black Lace Up Desert Boots and I can't tell you how many times I've tried to get my brother to try some on! They are the perfect pair of smart casual shoes, so you can wear them with jeans or with a suit. I especially love the suede finish and shape of the shoe, these should be a statement item in every man's wardrobe. Finally, it is a lot colder now so I've picked out a coat also, the outfit is very black, white and blue at the moment so this Dark Red Single Breasted Mac Coat will add some subtle colour. I think it would tie in the outfit together really well but at the same time it still looks good without the coat. I think Autumn is the best time of year to re-vamp your wardrobe so get the men in your life to take a look at what the New Look Menswear Range has to offer, I don't think I'll ever stop trying to get my brother to put a bit more thought into his style! Who is your Man Crush? Do you like his style?